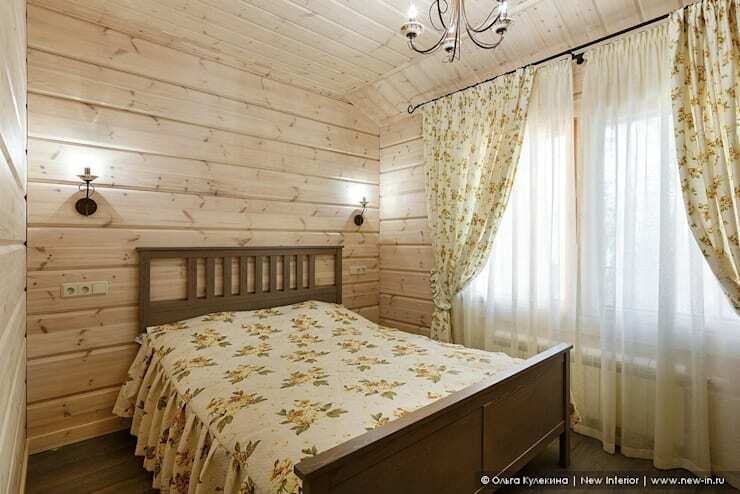 Located in the suburbs surrounding St. Petersburg, Russia, this country home is a vision of peaceful family living. The exterior has been designed with a clear country cabin influence, its golden wooden walls standing as an emblem of simpler times. Inside, the home gets a fresh feel through Scandinavian style decor that keeps things light and sophisticated, filling the home with soft palettes and intricate patterns. Much larger than the average Canadian home size of about 1900 square feet, this country home enjoys a spacious floor plan of 2700 square feet, giving this large family plenty of room to breathe. On the outside, this well-balanced design is a vision of old-fashioned simplicity. In a central arrangement, the architects have placed the heart of the home at the intersection of two perpendicular masses, forming a central area where you'll typically find the high-traffic commons spaces like the kitchen and the living room. The left side of the home offers an open porch that enjoys a close, railing-free connection with the woods, where a hammock can be seen resting gently between two wooden support beams. As you'd expect in a country home, this family enjoys a wide front porch large enough to seat the whole family for a board game or outdoor dinner. A chandelier resembling a cluster of old-fashioned lanterns takes things back a century, creating an intimate gathering space with a subtle hint of nostalgia. The entrance to this home is foretelling: no matter the shape and size of the rooms in this house, most everywhere you go you'll feel a sense of freedom and spaciousness. Take this hallway for example – the space is narrow, with a wall on one side and coat closet on the other, but a wide panel of window-shaped mirrors adds a much larger visual dimension to the room. 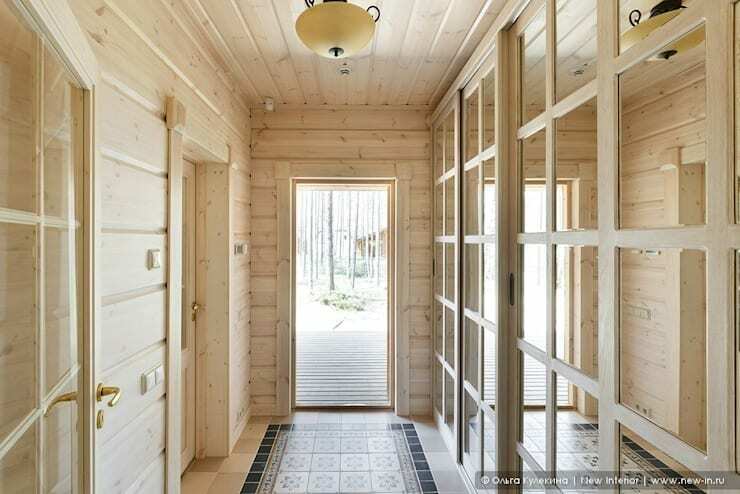 The light beige wooden panels that cover the majority of the interior spaces of the home offer a soft, smooth sensory experience, and the decor throughout the home compliments this soft look. 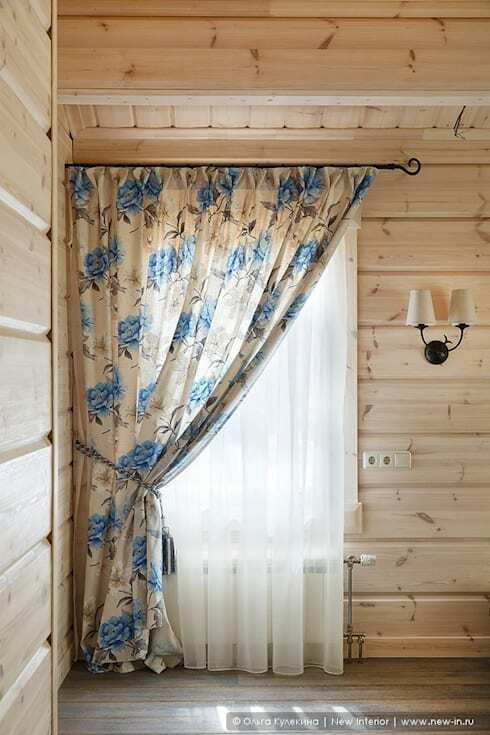 Here, a gauzy curtain softens the bright light shining through the window, its faded blue floral pattern creating an antique image. You'll find that many rooms of this home have been decorated with a blue theme, bringing a sense of harmony and rich peacefulness into the space. 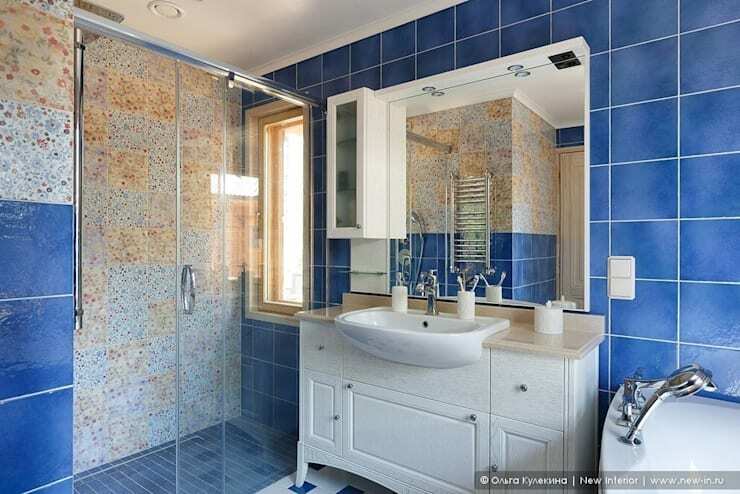 Blue is an especially appropriate choice for a bathroom like this one, where washed-out tiles create an almost watery effect. Building on the soft textural themes of this home, this bedroom offers a sleeping environment that's both sophisticated and earthy at the same time, with enough ruffles and elegant, sweeping lines to conjure a sense of refinement, and enough wooden textures and antique prints to instill a more humble vibe. 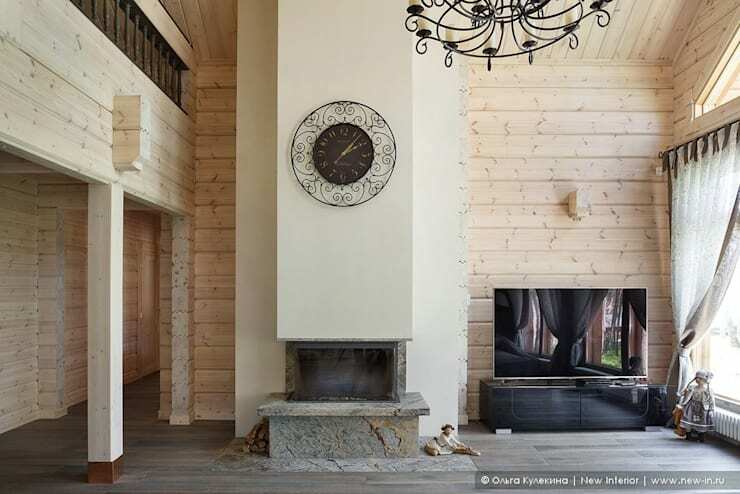 This living room is a great example of a Scandinavian-style living room, with a lofty vertical arrangement and light neutral hues on the walls. A smooth grey floor abides by the understated nature of Scandinavian style, while ornate metalwork in the clock and chandelier serve to elevate your gaze to the open space created by the raised ceiling of this central room. 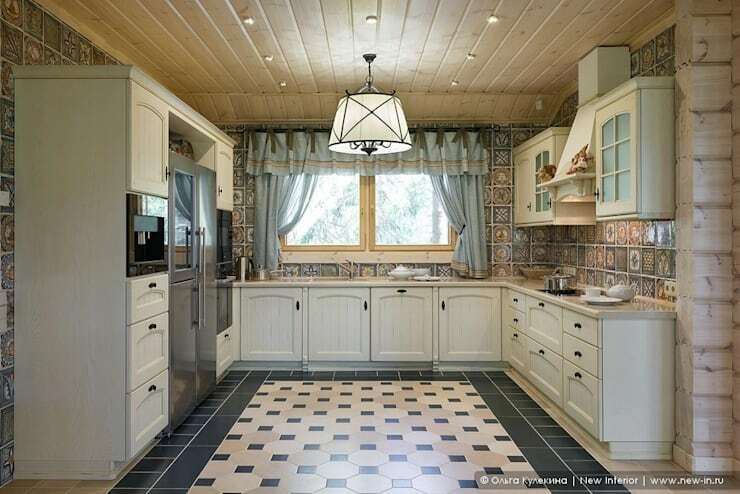 If there ever was a vision of country sophistication, this kitchen is it. With ruffled curtains on the window and white cabinets dotted with black handles, the space offers up a traditional country kitchen look. This traditional style is blended with more luxurious modern elements like a smooth tiled floor, colourful patterned wall tiles, and stainless steel fridge. 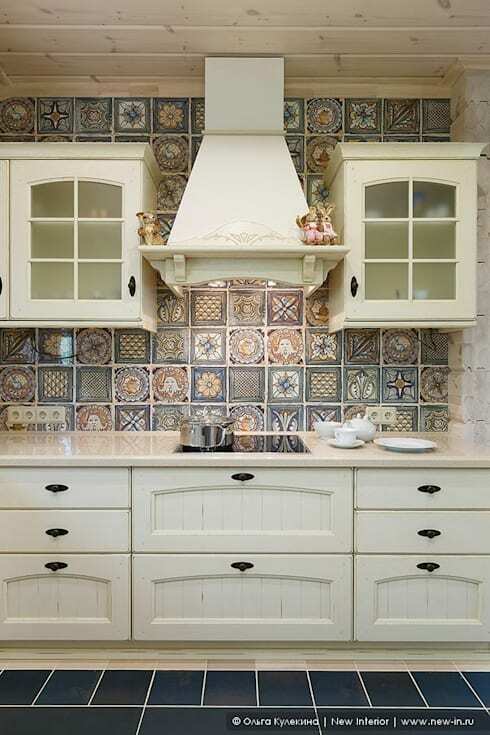 One standout feature in this country kitchen is this charming white stove hood – far from the shiny, crisp stainless steel designs that feature in many kitchens, these designers have given special attention to the old-school aesthetics in this room, installing a small white hood with decorative molding that fits in perfectly with the charming white wooden cabinets on either side. 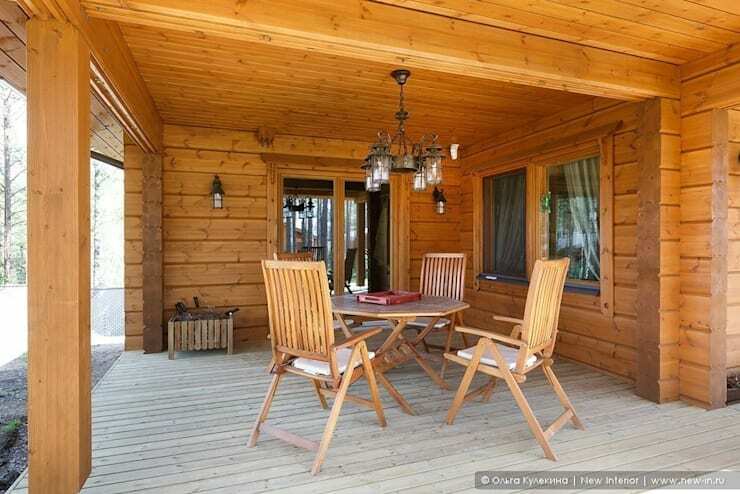 For another look at a country-style log cabin home, have a look at this massive, majestic wonder! 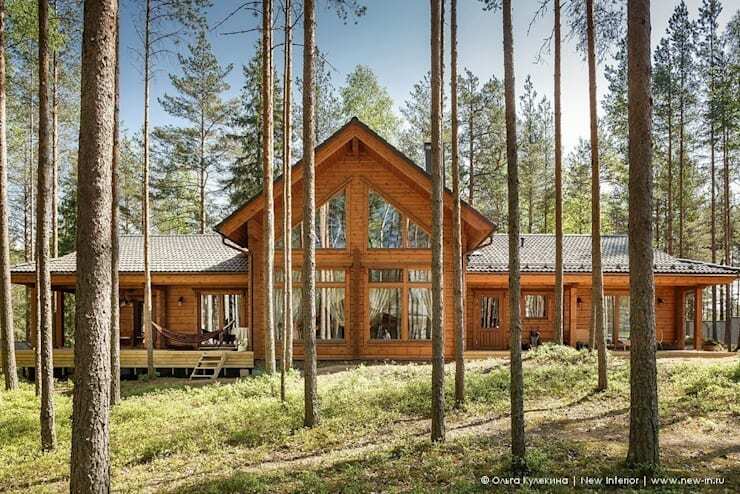 What do you think of this wooden country house? Comment below!